A first rate Power Metal album, albeit with heavy gothic influences. To me, Power Metal always conjures up the sound of exhausting double drumming, equally frenzied guitar and those huge choruses. If that's also your interpretation, and "it's your bag baby", then I have something of interest for you. Some readers, who are fans of Power Metal and the likes of Freedom Call, will already know about Powerwolf. For those who aren't, Powerwolf is a multi-national band formed back in 2003 that have set themselves apart by opting for a gothic tinged and darker interpretation. 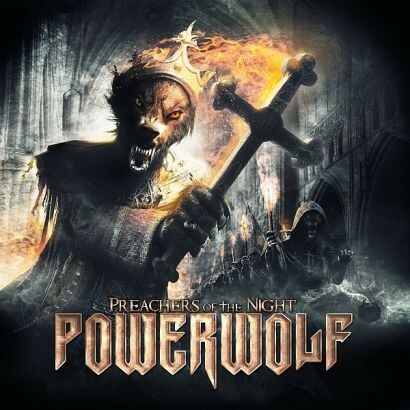 Despite enjoying Power Metal, I was one of those unfamiliar with Powerwolf; their new release 'Preachers Of The Night' being my first exposure. I agree that whilst they have all the recognised ingredients, there is a different gothic slant via lots of gloomy choirs and haunting keys. Some tracks are more traditional Power Metal sounding like 'Amen And Attack', 'Secrets Of The Sacristy' and 'Lust For Blood'. They steam along at express pace with lots of growled vocals from Attila Dorn except in 'Sacristy' where he takes a more operatic approach that grated a bit. The axe work is frenzied, whether kicking out a charging riff or soaring high with finger bleeding solos that sound almost violin-like. But even in these there's a certain gothic feel with the added choirs. This is taken further in 'Coleus Sanctus', 'Cardinal Sin' and 'Extatum Et Oratum' where the choirs and keys are given far more prominence. The mix of typical Power Metal and that Classical Gothic sound really is effective and 'Coleus' and 'Extatum' are two favourites. The other has to be 'Sacred And Wild' which is one of the slower tracks with a groovy chugging riff and a big bombastic chorus. I suspect that it's going to be a fun one live when they play the Camden Underworld on 27th September. If you stripped out all the extras and made this pure Power Metal it would be a pretty good album. However, with all the gothic additives mixed in, this becomes a far more individual and impressive listen. It's this alternative take that also makes 'Preachers' more accessible to other fans like those who enjoy brooding choirs. The only negative is that despite being a fine singer who can wander from wail to roar easily, he does get a little over operatic at times. That didn't really work for me but thankfully it is only occasional. This is a first rate Power Metal album, albeit with heavy gothic influences, that I recon will appeal to many whose tastes include these genres. I can tell you that the 'Preachers' have converted this soul and I'm really looking forward to the September show.